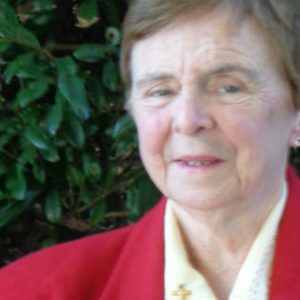 Working as a Vision Australia volunteer has been far from what Sr Angela Burke rsc expected. Although she initially signed up to read and record books, for the past three years Angela has had a rewarding and enriching experience working in the home visit program. 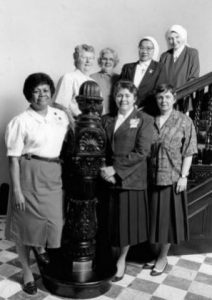 The former teacher, archivist and librarian thought of Vision Australia as the perfect organisation to support as she entered retirement and returned to Sydney from Melbourne. “Years ago I’d volunteered with the Royal Blind Society,” Angela says. When Angela first signed up, a conversation with Rolf Geerlings, a Vision Australia coordinator of volunteers, set her on a much different path from simply reading and recording books. “When I first met Rolf, I told him that I was a Sister of Charity and had been a teacher and an archivist and that I loved singing, music and drama,” Angela says. As its name suggests, the home visit programs involve volunteers providing support and assistance to Vision Australia clients in their homes. Rolf and Vision Australia work hard to match volunteers with clients who need help with tasks that match the volunteers’ skills. For Angela, that could be anything from taking a client for a cup of coffee to helping somebody transcribe text to braille. “There was one client I’d visit every week and dictate music to her so she could use her braille machine to produce music she could read. There was another who was in year 11 and I’d help her with things like reading textbooks or preparing for her exams,” she explains. Angela considers all the clients she has worked with as friends, but there are some bonds that develop further than others. Every Tuesday morning, she visits one lady to offer support after the recent loss of some close family members. “When I first started visiting her it was to do a mobility walk, but now we might go for a drive and have a coffee somewhere or I’ll take her shopping or help her with whatever else she might need. Along with being matched with clients who would benefit from her skills, Angela believes the trust she’s been shown by Vision Australia has also helped her feel comfortable in her role with the home visit program. “Rolf has been fantastic in his support and trust. Rolf told me that he trusts my judgement and if I want to do something for a client to do it, and that I don’t need to ask him about everything,” she says. Although for some tasks it’s important Angela keeps Rolf informed, she appreciates that in many instances he gives her the freedom to do what she thinks is best. With Angela’s role requiring her to enter the home of somebody who she might barely know, she says her time volunteering has taught her some valuable lessons. “It’s definitely been something where I’ve got as much out of it as they have. The people I’ve worked with have just accepted me for who I am. This article first appeared in the newsletter produced by Vision Australia 23 February, 2017. Reproduced by kind permission.